Believe it or not, we started this B & B adventure thinking we might do if for five years. That was 15 years ago. It has turned out that we get to live in a nice place with housekeeping service and greet guests who are all happy to be here. We are very fortunate. For what more could a retired person ask? 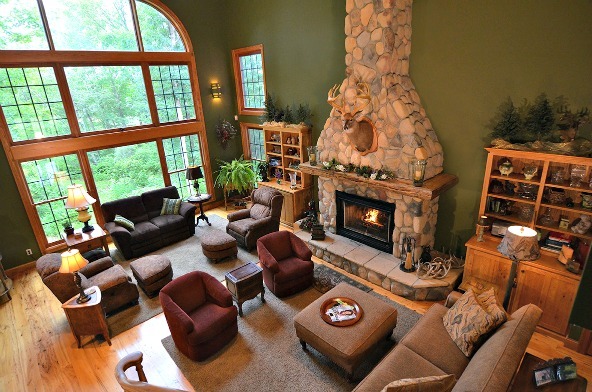 Returning guests are an ultimate compliment for any B & B. Recently, we had three couples staying with us who had each been here many times. We went to our reservation software and counted up their stays – a combined 48! Shown here are the couples: Katie and Marty from Columbia Heights, Cynthia and Jim from Rothschild WI and Jennifer and Chis from Forest Lake. 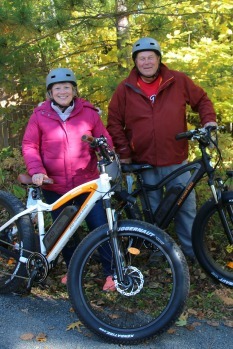 Shown here are Wanda and Tim, Northfield, about to go for a ride on our trails. The electric bikes offer two options for driving: One is a throttle like a motor scooter with no pedaling is needed. The other is pedaling assist in which you decide how much help you want when pedaling. Either way, the bike will go up to 20 miles an hour with little effort. 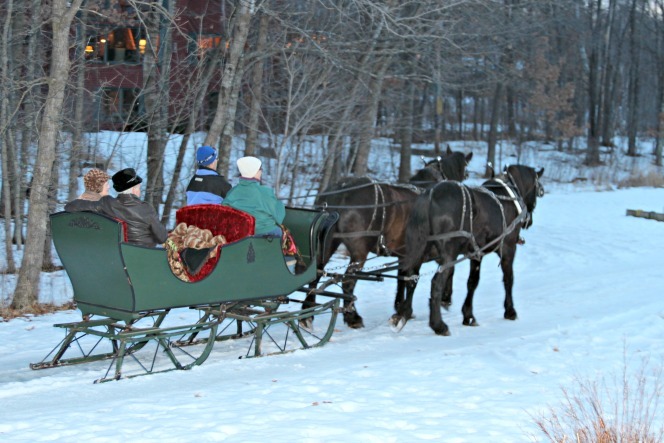 Dozens of couples have enjoyed horse-drawn sleigh rides for the past eight winters. Some even had a sleigh ride on their bucket list. The rides were provided by Darwyn and Pam Brown. Their horses were huge but perfectly trained Percherons that Darwyn drove with quiet voice commands. Taking one couple at a time, Darwyn acted on each ride as though it were his first, giving a full explanation about his horses, the sleigh and the antique blankets under which couples could snuggle. Sadly, Darwyn lost Bella, one of the Percherons, two years ago to colic. Then he lost Ace, Bella’s brother, to the same thing this summer. Darwyn said it is too sad to risk going through this again so he and Pam have sold their last horse and moved on to another hobby, woodworking. We thank Darwyn and Pam for providing such great memories to our guests who rode with them. Both dogs are still puppies and learning their bed and breakfast manners. One thing they do well is accompany guests on walks. 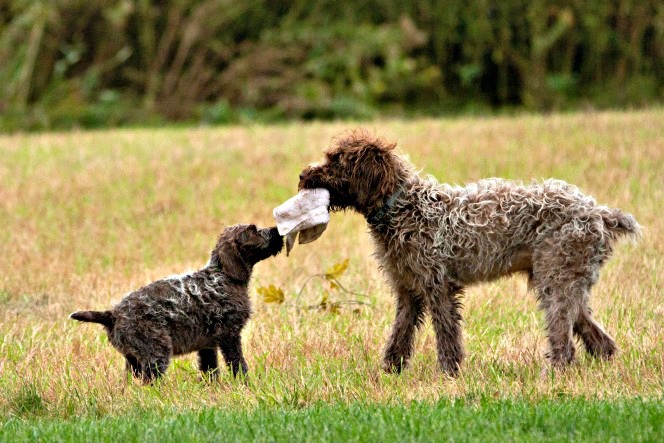 It is very entertaining to see the dogs wrestling and chasing each other while they let the guests choose the route. 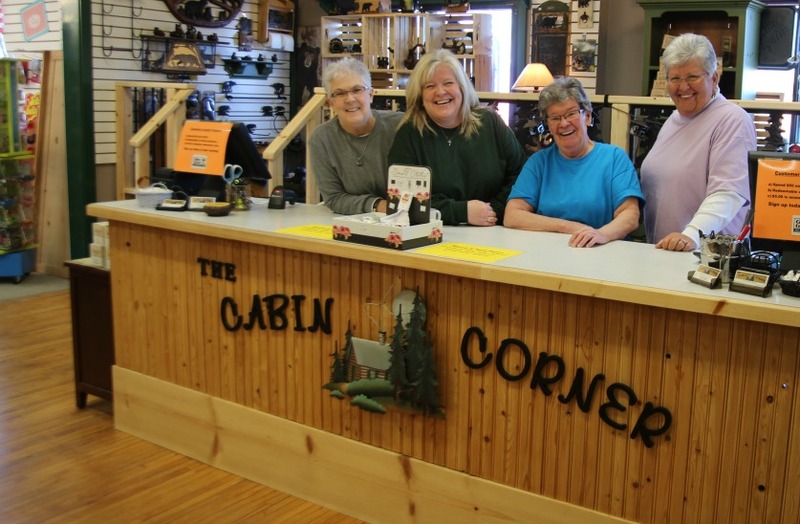 Sandra’s new favorite shop is Cabin Corner located in Danbury. This shop has a nice variety of tasteful high quality gifts and clothing, plus a unique candy shop attached. Best of all, owners Tiffany and Linda and their staff greet each entering customer as though they are the most important person in the world. A stop at Cabin Corner is a fun experience. 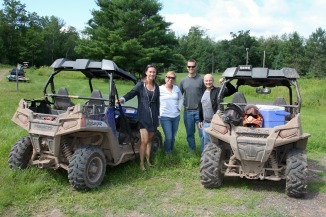 More guests are bringing their four-wheelers to ride on nearby trails. Local rules permit riding the roadside from our driveway to the trailhead a half mile north. From there riders can go for miles on trails in Minnesota and, after crossing an old railroad bridge turned four-wheeler trail, even more miles in Wisconsin. There has been a change in our restaurant recommendations. Tesora in Siren has been our recommendation for a nice dinner for several years. However, Testora has been closed due to the illness of owner Jake. Our new recommendation for that nice dinner is the Winds Steakhouse at Grand Casino where the ambience, service and food are all excellent and the prices are better than those at nice restaurants in the city. A new recommendation for a nice Italian dinner is Italia Restorante. 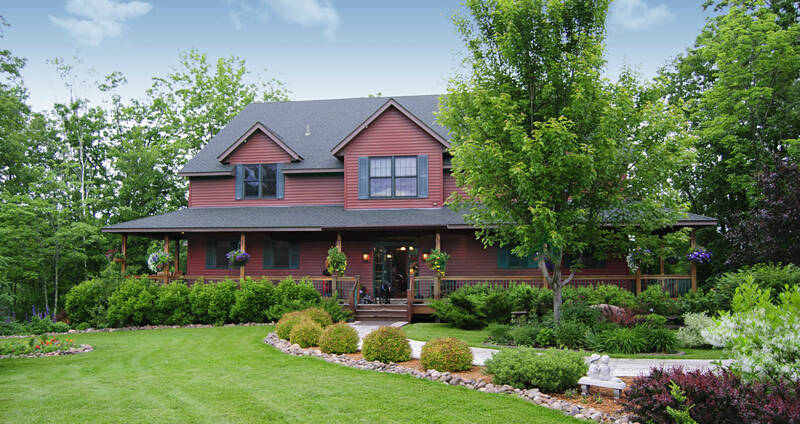 Located near Hayward, Wisconsin, it is too far away to go just for dinner but fits well with a day trip to Hayward. 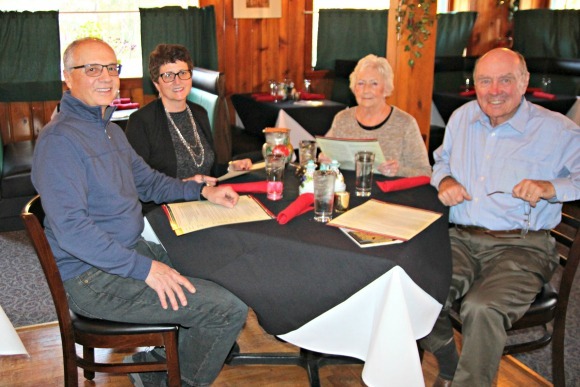 Innkeepers Sandra and John, along with guests Cynthia and Jim, are shown on their evaluation dinner at the restaurant. Our recommendation for a close-by meal has not changed: The Fish Bowl Bar and Grill located just six miles from Woodland Trails. Owner Burl Johnson is celebrating his 20th year in business and continues to provide good food at very reasonable prices. Thank you for staying with us in the past. We hope you can arrange a stay with us during 2019! This entry was posted in Guests Having Fun, News from the Inn by admin. Bookmark the permalink.